This podcast features the music as well as an interview with drummer E.J. Strickland. 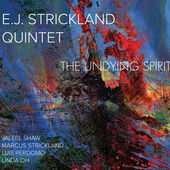 Strickland, also a composer and bandleader is one of the more in-demand drummers in NYC. We speak about his family, composing music, and living in New York pursuing this art form. Other artists featured are Noah Preminger, Tom Harrell, Rez Abbasi and others. This year's Newport Jazz Festival promises to be a great one. We play many of the artists that will be appearing during the 3 day festival (July 29 - 31). You'll hear from some of the 50+ artists that will be performing in this historic jazz festival. I'll be there to report live via social networking (facebook, twitter, instagram), and a review on WWUH in coming weeks. But it is best to experience the festival live. You can get more information and purchase tickets at www.newportjazzfest.org . This podcast kicks off with music from Kris Allen, Earl MacDonald and Jimmy McGriff. We then highlight the Paul Brown Monday Night Jazz Series in Hartford with the first 4 of 6 concerts presented by the Hartford Jazz Society. The podcast concludes with music from newcomers David Gibson, Victor Gould and Sheryl Bailey. After a week dominated by racial injustice, protest and violence this broadcast takes on a contemplative tone. Tyner's Search for Peace seemed an appropriate way to lead off the show. A Jimmy Greene set is also featured here to review his recent performance at Wesleyan U this week. Other artists represented are Shirley Horn, Cecile Salvant, Buster Williams, Alan Ferber and Hiromi. Hank Mobley ~ Up Over and Out ~ Reach Out! A couple of new albums start this podcast. David Gibson; trombonist, composer, arranger and Ray McMorrin (sax) with roots in Hartford now residing in Japan. That is followed by a Stanley Clarke set for his 65th birthday. Metheny, DeJohnette and drummer E.J Strickland wind up this week's podcast.